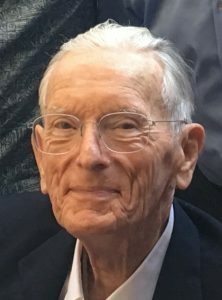 Age 96, passed away in California on October 23, 2017. He was a distinguished faculty member of the UCLA Dept. of Neurology for 63 years, and continued to be an active member until his death. For 17 years, he was Vice Chairman of the Department and Chair of the Residency Selection Committee. The son of Christian Herrmann, a Lansing tailor and haberdasher, and Agnes (Bauch) Herrmann, a conservatory graduate who taught piano and voice. Dr. Herrmann became a proficient pianist, organist and pipe organ aficionado. His childhood home, known as the Herrmann House, is now the residence of the Lansing Community College’s President. He was a graduate of the University of Michigan medical school. He completed his internship in Detroit, and his residency at the Neurologic Institute of New York at Presbyterian Hospital. Dr. Herrmann will be laid to rest in the Herrmann family plot at Evergreen Cemetery. He is survived by several cousins and their families: George Nugent, Linda Harrold and Susan Brewster, in the Lansing area and Lois Blumka in New York City.